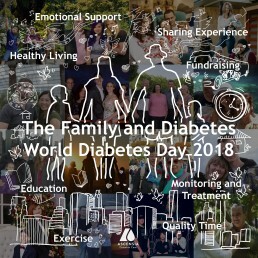 The official theme for World Diabetes Day 2018 was The Family and Diabetes. Our client, Ascensia, knows that diabetes has an impact on families. Our core idea was to communicate in an inspiring way that Families have a critical role to play in discovering, preventing and managing diabetes. That they give people with diabetes the love and support they need. The campaign idea was to ask people across the world to share their photos and stories of loving and supporting family members with diabetes. We would then take these family photos and create a digital campaign that illustrates these inspiring stories by adding artistic line drawings in dynamic animation on top of their original photographs. We created 38 pieces of content in 24 different languages and adapted them for sharing on the various social media channels with a reach of millions on the day.